Last week Duane Lineker (Ocean Beach), Clodagh Enright (Flaherty’s Irish Bar) and myself were present at a meeting chaired by Deputy Mayor Pablo Valdes for local businesses to have their say on the way forward for San Antonio. Many subjects were discussed such as refuse collection, noise pollution and public image however the media (who are a good barometer for local issues) were only interested in 1 topic and that was bar and club closing times. There’s been much heated debate about this since former Mayor Pepita Gutierrez took it upon herself to change the West End bar closing times from 6am to 5am without formal consultation. Her reasoning was that if the bars closed at 5am then local residents wouldn’t have to face the remnants of a night out on their way to work the following morning but the 5am closing doesn’t appear to have stopped all the people from partying, some carry on drinking at the local beach therefore moving the ‘problem’ from a contained environment to a public place. 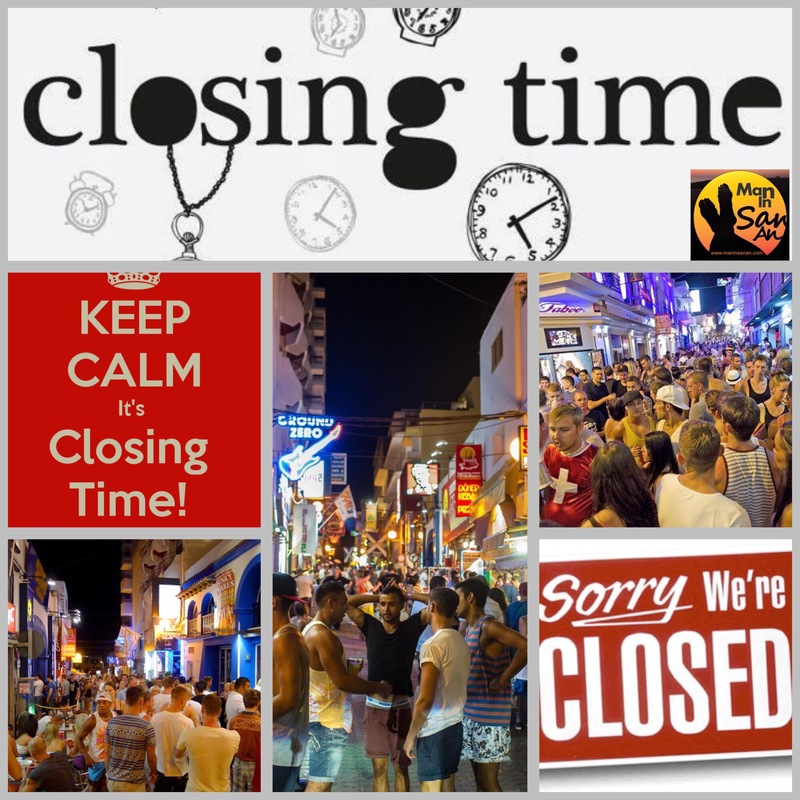 It wasn’t that long ago that Ibiza bars could open as and when they wanted including ‘after hours’ from 6am but now there are several different rules governing 1 town. For example, a large nightclub on the outskirts of San Antonio is allowed to close its doors at 8am whereas one in the middle of town needs to be closed by 5am. Daytime has also been restricted so music can’t be played until after 4pm. Our newly formed British Association has many members who are bar owners and they consistently point to their restricted opening hours as reason for them going through tough times. To throw more fuel on the fire San Antonio is no longer the preferred Ibiza destination for many of the traditional 18-35 market and the new resorts don’t seem to worry too much about noise pollution. With all the competition and local law changes there has been very slim pickings on offer for bar owners over the last couple of years. The new 3-party coalition governing San Antonio was voted in after promising local residents a fundamental change but it appears that in all the debates, accusations and counter accusations many local people have forgotten that San Antonio relies solely on tourism and, rightly or wrongly, became famous as a the town where you could party until sunrise (if you wished). Now in many cases the UK licensing laws have been relaxed whilst Ibiza’s has been tightened, a role reversal. Social media has also given a clear voice to local San Antonio residents who have made it perfectly clear that they voted for change and that is what they expect and they are pointing the finger at the British community as the cause of most of the noise and control problems but when the majority of tourists are from 1 place then that is always going to be the case. A consensus needs to be sought that reflects the needs of the residents but also gives the bar and club owners a fair crack at earning enough money to get them through the winter. It won’t be easy but negotiations will start soon so new laws can be in place by summer 2016. New laws that are fair on everyone and reflect the needs of all the community and don’t favor residents over commerce or clubs over bars. No one said it was going to be easy. Thank you Martin for posting these issues in English, your ongoing involvement can only help the community and the Island (let’s face it it, it needs an Englishman to shake things up, ha ha) not sure I should have put that, but well done for just being bothered. Catalina on The Guiris are Here! Dave Butler on The Guiris are Here! John Mclean on The Guiris are Here! "MAN IN SAN AN" by Martin Makepeace Blog at WordPress.com.